How much do Indians pay for houses? If you thought home ownership was a sign of wealth and prosperity in India, think again. Unlike in the West, most poor people live in their own homes in India, and it is the relatively more affluent sections of Indian society that live on rent, shows data from a nationally representative consumer survey conducted this year. Ninety-seven per cent of households belonging to the bottom-income quintile (or the bottom 20% of India’s income distribution) live in their own homes, according to the Household Survey on India’s Citizen Environment & Consumer Economy (ICE 360° survey) conducted in 2016. The proportion of households in the top-income quintile (or the top 20% of India’s income distribution) who live in their own homes is relatively lower at 81%, shows the survey. As you move from an underdeveloped rural area to a metro, the chances of renting a house increase, shows the survey. It also reveals a stark difference in how much top-income groups spend on home purchases compared to middle- and lower-income groups. Overall, 89% of households stay in their own homes. 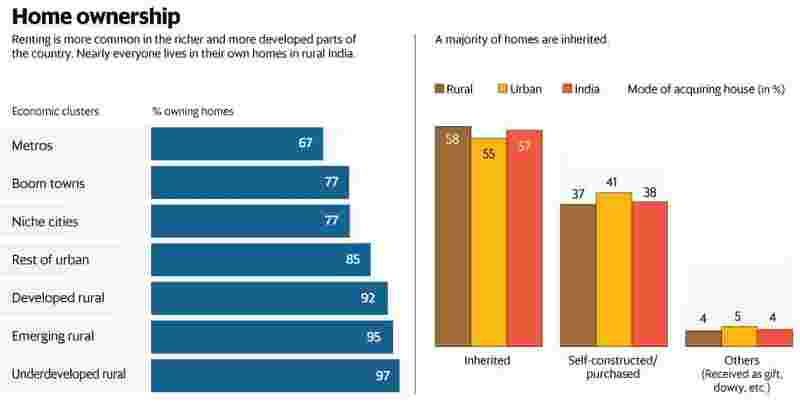 Of those staying in their own homes, 57% live in inherited homes, 38% in homes that they have purchased or constructed on their own, and 4% live in homes that they have received as gift or dowry. The ICE 360° survey was conducted by the independent not-for-profit organization, People Research on India’s Consumer Economy, headed by two of India’s best-known consumer economy experts, Rama Bijapurkar and Rajesh Shukla. The survey is among the largest consumer economy surveys conducted in the country. The urban sample of the survey is comparable to that of the National Sample Survey Office (NSSO) survey. While NSSO surveyed 101,651 households of which 41,968 (41.3%) were urban households, the ICE 360° survey covered 61,000 households of which 36,000 (59%) were urban households. The rural sample of the ICE 360° survey is less than half of the NSSO sample. Nonetheless, all the estimates of each region have been derived by adjusting for the respective population of those regions. A notable feature of this survey is that it is representative at the level of economic clusters. Urban India has been divided into four clusters: metros (population more than 5 million), boom towns (2.5- 5 million), niche cities (1-2.5 million) and other urban towns (less than 1 million). Based on a district development index, rural India has been subdivided into three different clusters: “developed rural", “emerging rural" and “underdeveloped rural". The first category includes districts such as Bhatinda and Kangra. The second category includes districts such as Latur and Kamrup, while the last category includes districts such as Kalahandi and Bastar. The survey shows that the median house price in a metro is Rs15 lakh. It also shows that it is more expensive to purchase a house in a niche city than in a boom town. The median house price in niche cities at Rs10 lakh is higher than that of boom towns at Rs8 lakh. The median house price in an underdeveloped rural area is Rs2 lakh whereas the median house price in a developed rural area is Rs5 lakh. The survey also shows a big class divide in home ownership. 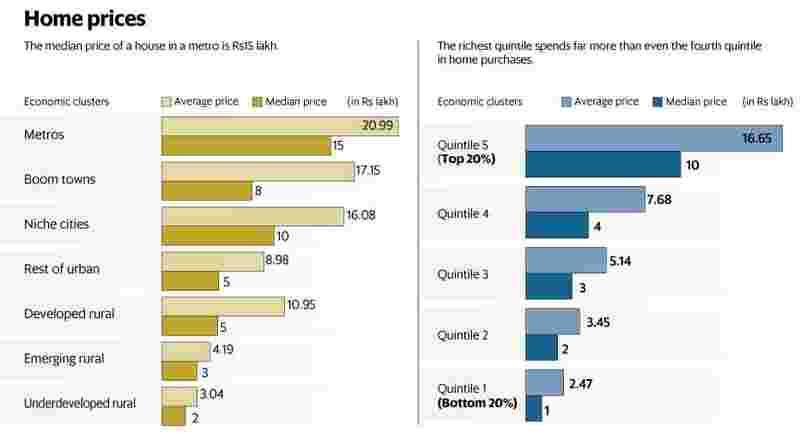 The median price paid by the bottom quintile to buy a house is Rs1 lakh, while the median price paid by the top quintile to buy a house is Rs10 lakh. The median price paid by the richest 1% to buy a house is Rs18 lakh, according to the survey. The class divide in house prices is not so surprising given the qualitative differences in houses between the income classes. Forty-two per cent of the bottom quintile lives in kutcha houses whereas in the top quintile, only 6% households live in kutcha houses. Nationally, 20% households stay in kutcha houses, 35% in semi-pucca ones and 45% stay in pucca houses. In metros, 62% stay in pucca houses. Most of the remaining 38% who stay in kutcha or semi-pucca houses are likely to be slum dwellers who are unable to afford pucca houses. 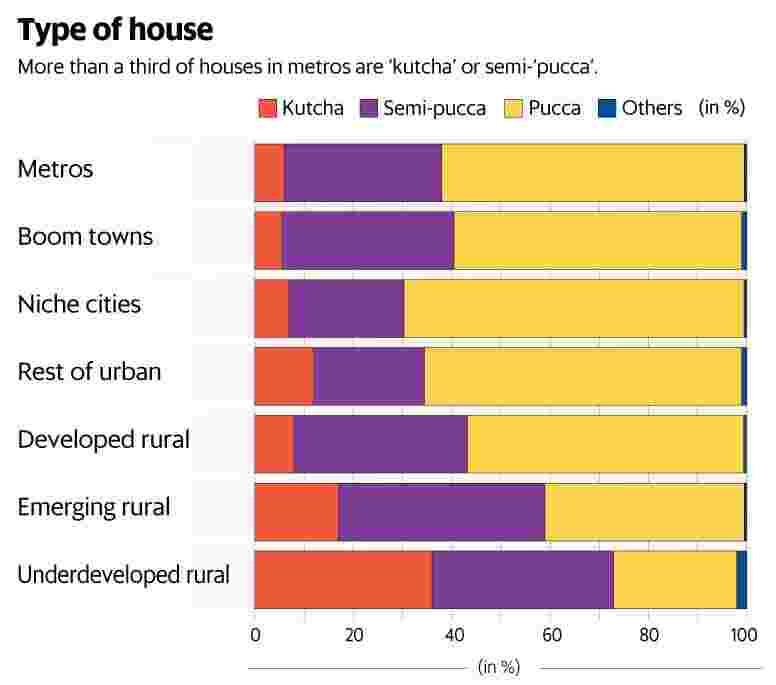 The proportion of households living in kutcha or semi-pucca houses in niche cities at 30% is relatively lower compared to that of metros. In underdeveloped rural areas, 73% households live in kutcha or semi-pucca houses. It is because of the preponderance of low-quality and small houses in India that most people in the country find themselves in the ranks of home owners. A study by an independent researcher, Arjun Kumar, published earlier this year in the Economic and Political Weekly, and based on data from a previous survey on house conditions conducted by NSSO in 2012 showed that the average area of each dwelling unit (house) was 431 square feet (sq. ft) in rural India and 422 sq. ft in urban India. In terms of per person area, urban areas are slightly better off, with an average of 124 sq. ft per person compared to 107 sq. ft per person for rural areas. To put these numbers in perspective, the median size of a completed single-family house in the US was 2,467 sq. ft, while that of a multifamily unit was 1,057 sq. ft, according to the United States Census Bureau data for 2015. The ICE 360° survey shows that 97% households in underdeveloped rural areas live in their own homes. In metros, the same proportion is much lower at 67%. Thirty-two per cent of households stay in rented houses in metros. Across urban India, nearly 21% urban households live in rented houses. In rural India, only 3% rent houses. A greater proportion of migrants and a bigger rental market in metros mean that more families live on rent in such cities. The average monthly rent in urban India is Rs2,659 while the average rent in rural India is Rs2,217, shows the ICE 360° survey. In 2012, the mean monthly rent paid by households living in rented houses was Rs886 and Rs1,919 in rural and urban areas, respectively, according to Kumar’s calculations, indicating that the past few years may have witnessed a significant rise in rent across rural and urban India. This is the third part of a 16-part data journalism series on how India lives, thinks, earns and spends, based on the latest results from the ICE 360° survey conducted by the People Research on India’s Consumer Economy in 2016 (ice360.in). The next part will look at access to household amenities across India.